If you were lucky enough to get an invite to The Division 2’s private beta, which is running this weekend, you’ll have found there’s quite a bit to do. Early missions include establishing contact with an outpost in one of D.C.’s historic theaters, recovering the Declaration of Independence from the National Archives, and exploring one of the game’s three Dark Zone areas. Now you can also get a taste of The Division 2’s endgame, with three maxed-out characters and a special post-story mission featuring a new enemy faction. Be warned: There are potential spoilers for The Division 2’s story, which apparently has quite the twist ending. If you log in to The Division 2’s private beta, you’ll now notice that you have three variants of the character you started. Each of these uses one of The Division 2’s new specializations – there’s the sharpshooter, the survivalist, and the demolitionist. These use a combination of signature weapons, unique gear options, and specialist skills that help fill out their particular role in a squad. During the main bit of the beta you’ll lock horns with enemy factions called the Hyenas and True Sons, but loading one of the max-level characters drops you in front of a piece of endgame content in The Division 2 called an ‘invaded mission’ – one of the story missions from the main campaign that has been ‘invaded’ by a new faction called the Black Tusks, a group of highly-trained professional soldiers equipped with some frightening tech. 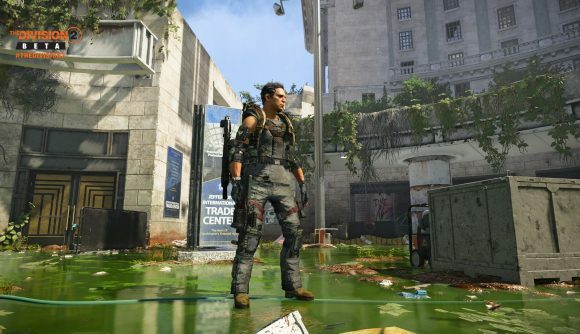 The Division 2’s private beta had some initial issues with maintaining connectivity – Ubisoft recommended restarting every couple hours in order to avoid losing progress. But since the first day, I haven’t had any problems myself. And as I said above, there’s an impressive amount of stuff to do in the few large areas open to explore. The Division 2 release date is scheduled for March 15, although buying either the Gold or Ultimate editions (which include the year one season pass) will let you jump in three days earlier so you can get a head start on collecting the best guns and rugged-looking clothing you can find on the streets of plague-ravaged Washington, D.C.